"THOSE DAMP FIELDS AND PERFECT CONDITIONS OF NATURE CREATE A TRULY UNIQUE ANIMAL. BUT THIS NEVER MATTERED, AND IT REMAINS SO TILL THIS DAY. BECAUSE IT’S NOT ABOUT MAKING IBERIAN HAM. IT’S ABOUT MAKING CINCO JOTAS ACORN-FED 100% IBÉRICO HAM." The meadows of aouth-west Spain ensure the best breeding conditions for 100% ibérico pigs. The health and natural diet of our pigs contribute to aromatic and delicious 100% ibérico ham products. Acorns are the hidden secret behind the incredible flavour of acorn-fed 100% ibérico ham. 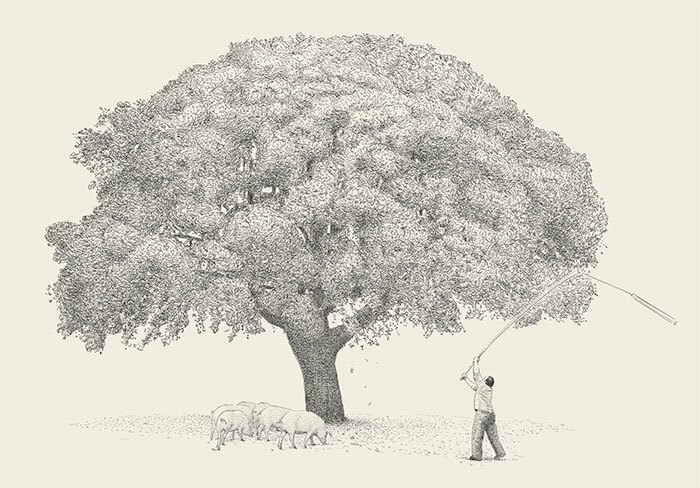 Though there are five different types of oak nut acorns in the centuries-old meadows of Spain (valley, gall, holm, cork, and kermes), the most common comes from the holm oak tree. As it matures the nut transforms from green to a translucent dark brown colour, culminating in the montanera season when the mature acorns fall from the trees for the pigs to enjoy. A cup-shaped dome covers a third of its surface area, as if the acorn were a treasure in need of special protection. Our pigs live free range from about two months old until their maturity at about 18-24 months. The piglets enhance their staple diet of acorns during their first year of life by enjoying other foods readily available in nature, including berries, roots, wild mushrooms, grass, herbs, nuts, and more. 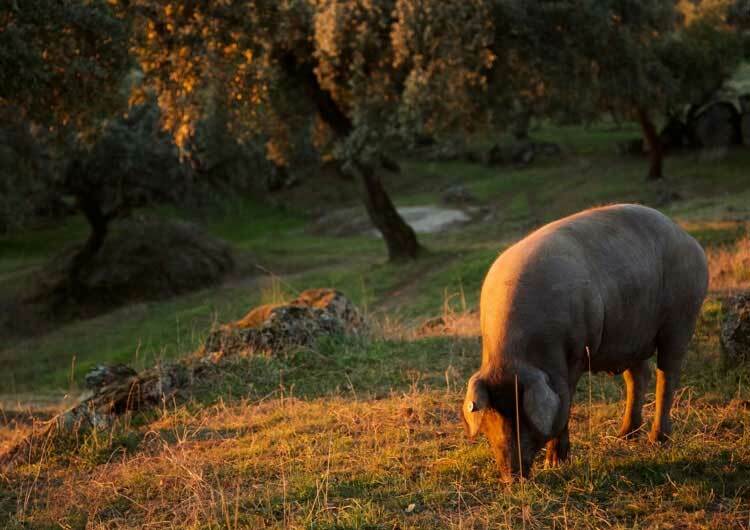 The pigs can walk up to 14 km in any given day during the montanera season to search for acorns, their principal diet that instills in them exceptional sensory qualities such as robust flavour, aroma and tenderness. 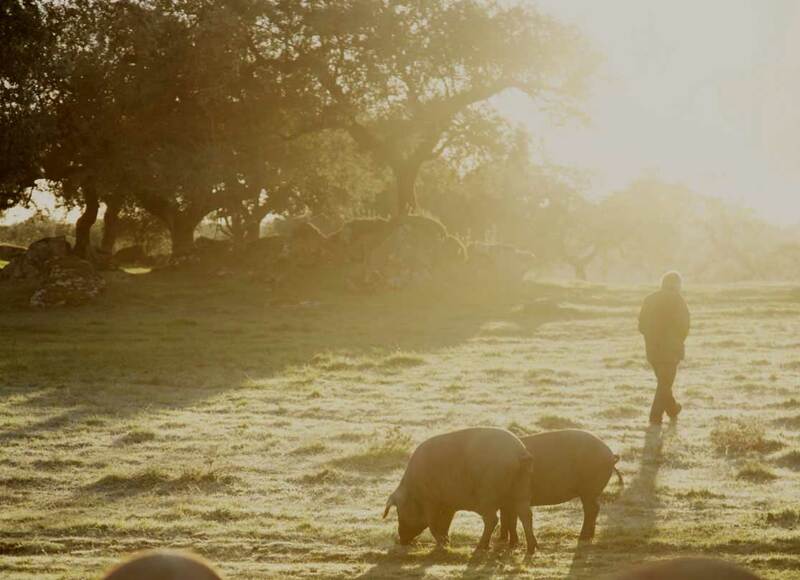 Cinco Jotas products, filled with unprecedented aromas and nuanced flavours, are made possible by preserving the centuries-old Spanish meadows and by respecting the free-range pigs in their natural habitat, where they enjoy a completely natural diet in the wild.